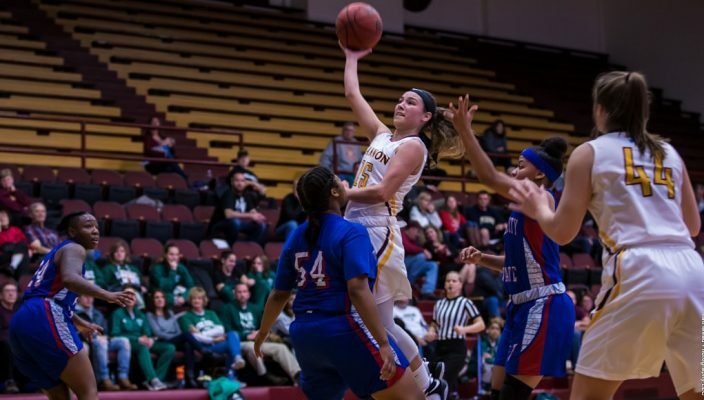 The Gannon University women’s basketball team used some red-hot free-throw shooting to extend its winning streak to three games Monday with a 62-53 victory over Clarion Monday at the Hammermill Center. The win left the Knights with an overall record of 9-9 and a 5-6 mark in Pennsylvania State Athletic Conference play going into Wednesday’s 5:30 p.m. Porreco Pride of Erie matchup across town against rival Mercyhurst. In Monday’s game, Chelsea Rourke led the way with 19 points while Nicole LaCava added 13. Lauren Tewes finished with eight points and 10 rebounds as Gannon outrebounded the Eagles 39-32. The Knights’ big edge came at the free-throw line, as they converted 19 of 20 attempts to Clarion’s 9 of 15. Gannon’s bench also outscored Clarion’s 16-8. Gannon trailed 23-22 at halftime but used a hot third quarter to build a 40-33 lead. Clarion pulled to within 48-45 in the final quarter but could not get closer. During the Christmas break, the Knights played seven games, winning two and losing five. But they came out of the break with an impressive 71-57 road victory over Edinboro on Jan. 16. The Knights went ahead by 20 points at the end of the third quarter with standout performances from Boston McKinney and LaCava. The duo combined for 41 of the 71 points that Gannon scored. The two wins during the Christmas break occurred against Shippensburg University at the Hammermill Center, 95-56, on Dec. 18 and against Seton Hill, 79-65, at Greensburg on Jan. 12. The win against Edinboro started with a strong first half for the Knights. Rourke opened the score with the first two baskets of the game, which sparked a quick 8-1 run. LaCava and McKinney scored the final two buckets of the first quarter to leave Gannon leading 12-6. LaCava opened the second quarter with four points to extend the Knights’ lead to 10. Without leaving Edinboro any chance to score, Haley Tewes went on a mini-run of her own with five points, expanding the Knights’ lead to 15 at 21-6. Gannon’s lead grew to 31-12 with 1:58 left in the opening half and the Knights ended the half with a 19-point lead. Rourke pushed the lead at the start of the second half to 23. At the 7:42 mark, the game was 41-18 for the Knights with a pair of layups by Rourke. The Scots were able to cut the lead and put together a 13-1 run to slice that lead to 11 at 42-31 before the start of the final quarter. But Edinboro could not cut Gannon´s lead to single digits as LaCava and McKinney each pushed it back out to 13. Four free throws from LaCava and McKinney and a 3-pointer by Sydney Mitchell pushed the lead back up to 20 at 53-33. Two minutes into the fourth quarter, Edinboro pulled to within 58-45 and a quick 8-2 burst from the Scots saw them cut the lead to less than 10 for the first time since early in the second quarter. Tori Obenrader and McKinney each hit a pair of free throws to bump the lead back to 13 point for Gannon. After a missed 3-pointer by Edinboro with less than a minute remaining, the Knights were able to bleed the clock and secure the victory. Following Wednesday’s meeting with Mercyhurst, Gannon will return to action at 1 p.m. Saturday on the road against Millersville before hosting Slippery Rock at 5:30 p.m. Wednesday, Jan. 30, at the Hammermill Center.